One of the things I've felt important to me, as an adult, is to face my fears. At least some of them. Maybe especially the fear of flying, as I love to travel. It was easier to travel when I lived in Oslo, and worked in a travel agency, in a few years I visited Japan twice, travelled around the world once, and got quite a few trips to differents cities in Europe. My fear of flying wasn't exactly cured, but it was close. There haven't been that much travelling the last few years, for a number of reasons, so my fear of flying is slowly, but surely coming back. When I realized that the plane for one of the trips I'm going on this summer, seems to carry max 68 passengers, I could almost feel my heart beating faster, and my shoulders rising up to my ears. Any plane carrying less than 150 passengers is too small, in my eyes. The bigger, the better. But, it's time to face my fear again, and show it who's the boss. I shall beat my fear, it shall not beat me. 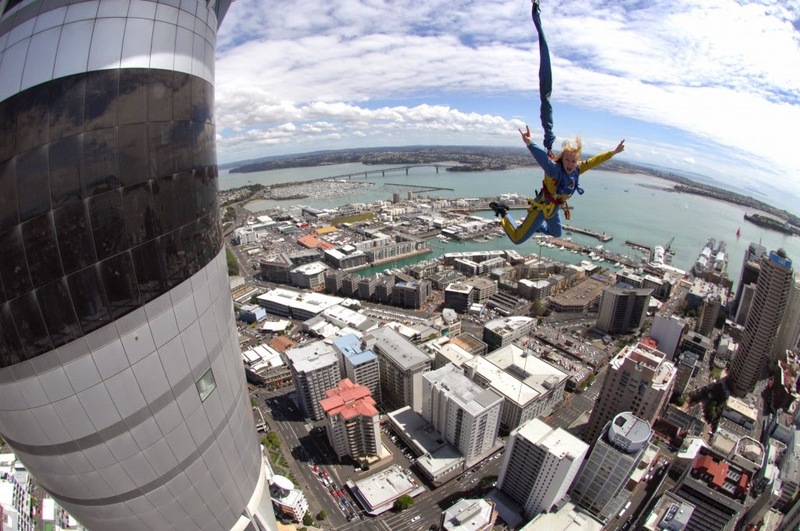 Tower in Auckland, New Zealand. Both getting there, and jumping, would be the ultimate challenge. I got the idea from The biggest loser season 11, I think, where they went to New Zealand, and actually jumped from the tower. It looked amazing!